Torquay United have signed a memorandum of understanding for a takeover of the club by Gaming International Ltd.
A statement by chairman David Phillips said the two parties are now in the process of completing due diligence. In 2015, he led a consortium of local businessmen who purchased the National League club from Thea Bristow. "If and when a deal is completed, this will be wonderful news for TUFC," Phillips said. "There will be significant finance put into the club." Last summer's takeover led to budget cuts which have coincided with the Gulls struggling near the bottom of the table. They are currently 22nd, two points from safety, with seven games left to play this season. 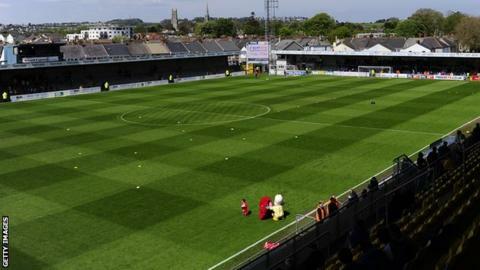 Torquay's financial problems have included claims that some players were on contracts worth "less than the minimum wage". Phillips' statement continued: "It is common knowledge that since the current board of directors saved the club from oblivion last June, we have lacked the finance to move forward. "Unfortunately this has indirectly reflected in the results on the pitch. "Among many things proposed by the new investors would be to resurrect the youth academy, which would be fantastic news for the club." Phillips urged supporters to "remain patient" and not cause any "unrest" as boss Kevin Nicholson and the team try to avoid relegation. "The next month is a critical period in the club's history. Any distractions, however well-meaning, will have a negative impact," he added. Based in Swindon, Gaming International Ltd, run greyhound racing tracks in England and Japan through its subsidiary, Stadia UK. It also operates the National Bowl in Milton Keynes, which hosts live music events.